Mosquitos can certainly be a nuisance around your home. A swarm of hungry mosquitos buzzing incessantly in your ear can ruin those perfect summer evenings dining outside on the deck. If mosquitos do end up getting into your home, chances are that you will end up losing a bit of sleep due to their constant buzzing in your ears. Fortunately, the best mosquito barriers are a natural and effective option to keep mosquitos away from your home. While most of the dangerous and potentially life-threatening diseases transmitted by mosquitos are confirmed to countries with a tropical climate, the recent Zika scare in places like South Florida and other hot and humid areas of the country with short, mild winters just goes to show how serious mosquito bites can be. With climate change poised to bring warmer weather into the northern hemisphere, the possibility of tropical, mosquito-borne diseases such as malaria, dengue fever, and the Chikungunya virus making its way to the North American continent is certainly a possibility. In this short article, we will offer a complete review of the top mosquito barrier products on the market today. Then, we will first look at some of the negative aspects of chemical repellents that so many people use to deal with mosquitos in and around their home. Finally, we will take an in-depth look at mosquito barriers, a natural repellent that combines effectiveness and safety to deal with mosquito infestations. There are several different mosquito barrier products marketed by different companies. We will look at the top four products that you can easily find online or at your local hardware store. 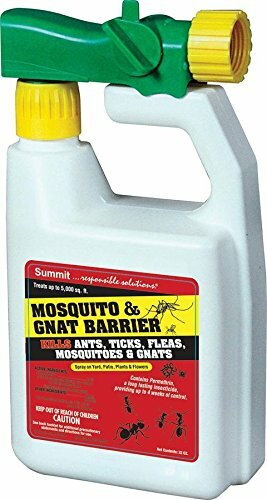 Summit Mosquito and Gnat Barrier Covers 5,000 Square Feet, 32fl.oz. This is the premier and one of the most trusted mosquito barrier products available on the market. Its commercial name is simply “Mosquito Barrier” because it was one of the first commercial products based on utilizing liquid garlic as a natural mosquito repellent. This product comes in a number of presentations, though the one-gallon liquid spray is the most common as it can be used to cover a wide area around your home. The manufacturer of this product claims that because mosquitos have a highly sensitive sense of smell, the concentrated liquid garlic extract will keep mosquitos away for up to three weeks. Besides being used for homes, it can also be applied to athletic fields, parks, and other public areas. Furthermore, when mixed soybean oil or other types of natural oils, this product can also be sprayed into areas of standing water where mosquito larva reproduce. This can help to prevent further mosquito issues around your home before they begin. The company Summit offers another natural product based on liquid garlic. This product is most often found in a half-gallon presentation. One of the benefits is related to the ease of application as it comes packed in a convenient hose end sprayer. What’s more, it is one of the most inexpensive mosquito barrier products on the market. One half-gallon presentation of this product can cover up to 10,000 square feet, which is more than enough for a typical suburban home and yard. Furthermore, when properly applied, it can remain effective for up to four weeks. The company Garlic Research Labs offers a number of innovative pest control products that are based on garlic extract. Their mosquito barrier products come both in one gallon and 32-ounce presentations. Like the other garlic barriers reviewed above, this product reportedly keeps mosquitos away from your home for anywhere between three to four weeks. Furthermore, the strong garlic odor with this product will disperse within a minute. It can be used not only to deter mosquitoes, but also to ward off other pests such as deer, rabbits, field mice, whiteflies, spider mites, leaf rollers, leafhoppers, ants, aphids, thrips, grasshoppers, and spiders. 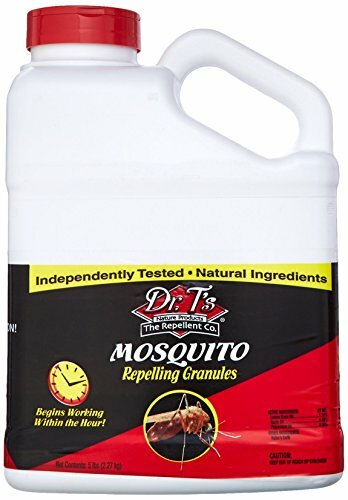 Finally, we come to a unique product offered by the company Dr. T. The mosquito barrier product they provide is a unique mixture of garlic oil, lemongrass oil, and mint oil. Unlike the other products reviewed above, this product comes in a granular form that you spread around your yard. One five-pound product can treat up to 4,000 square feet. This product is also biodegradable so you will not have to worry about cleaning up the granules afterward. Like all mosquito barrier products, this product contains no dangerous chemical pesticides. At the first sign of mosquitos, most people simply head for their local drug store to pick up a can of insect repellent. Alternatively, others opt for unloading chemical sprays around their home and in their gardens. While chemical insect repellents certainly can be an effective way of dealing with severe mosquito problems, there are a number of potentially dangerous side effects to both the health and the environment. A recent study by a pharmacologist from Duke University found that DEET, one of the most common insecticides used in insect repellents, could cause a number of adverse health effects on humans exposed to the chemical, including dizziness, skin irritation, nausea, burning on the lips, and impaired cognitive function. Furthermore, the study revealed that prolonged exposure to DEET (imagine families spraying up on a nightly basis) can also cause brain cell death and even behavioral changes. The recommendation that came out of the study was for people to choose repellents that did not contain DEET, even if they were less effective at repelling mosquitos and other bothersome insects. In other parts of the world, where mosquito-borne diseases are common and a serious health issue, the burning of mosquito coils inside homes is a common practice. These mosquito coils contain a number of chemical ingredients, including aldehyde, formaldehyde, fine and ultrafine particles, and benzene. The Environmental Protection Agency (EPA) agrees that many of these chemicals are known human carcinogens. While many mosquito coils (and other mosquito repellents) containing these chemicals are banned in the United States, these products can still make their way into the country via global trade. Many prominent scientists and healthcare leaders have begun to recommend switching chemical-based repellent products for more natural forms of protection from mosquitos. These products can include a host of natural products, including essential oils, garlic, and other plant-based repellents. A mosquito barrier is one of the most popular natural repellent products on the market today. While there are several natural repellents that are applied to individuals as a personal form of protection, mosquito barriers are generally designed to be applied to yards and around homes for a more widespread and environmental protection. If the mosquitos are repelled from your yard and the area around your home, there will be less of a need to spray your own skin with repellents. Mosquito barriers are mostly made from pure garlic oil that is sourced from some of the most potent species of garlic that are often not found in grocery stores. Garlic naturally contains high amounts of sulfur, which is a natural repellent to mosquitoes, ticks, and other bothersome insect pests that are prevalent in yards across the United States. Mosquito barrier products usually come in liquid form, which is then mixed with water and delivered using some sort of sprayer. The most important benefit of opting for a natural repellent like a mosquito barrier is that you will avoid the need to use harsh chemical insecticides. As we mentioned above, the extended use of chemical repellents will expose you and your family to potential human carcinogens. Furthermore, chemical repellents can lead to respiratory problems, especially for those who suffer from asthma. It has also been shown that children living in homes or areas where chemical repellents are regularly applied are at a much higher risk for developing leukemia or other types of cancer in young people. On an environmental level, insecticides that contain Neonicotinoids have been found to be lethal to a number of non-target insects, including earthworms and bumblebees. Bees are an important species for our civilization as they are responsible for pollinating a large number of the food crops we depend on. Earthworms play an important part in maintaining long-term soil fertility. Another major benefit related to mosquito barriers is that they are an efficient and economical way to deal with mosquito infestations around your home. Just one spray around your home and yard should be effective enough to keep mosquitoes at bay for upwards of a month—depending on the frequency of rainfall in your region. While the garlic and sulfur smell will still affect mosquitoes after several weeks, the rather unpleasant garlic smell will become completely undetectable to humans within 30 minutes after application. Finally, mosquito barrier products are DIY-friendly, meaning that you can treat the mosquito problem around your home without having to hire a professional. Not only will this save you money, but you will also be able to determine the frequency of each spray application depending on the number of mosquitos you detect around your home and yard. As we mentioned above, mosquito barrier products are made almost entirely from liquid garlic extract. When you open the bottle, the strong garlic smell will be very noticeable. The best way to apply mosquito barrier around your home is with the help of a simple backpack or pump sprayer that you can purchase at your local lawn and garden store or hardware store. Each different product will have a set of instructions for how to dilute the mosquito barrier liquid in water. Generally, for backpack sprayers, you should add 3–4 ounces of liquid mosquito barrier for each gallon of water. If you have a five-gallon backpack sprayer, you should add around a pound (16 ounces) of liquid mosquito barrier. For hose-end sprayers, you will want to mix 12 ounces of mosquito barrier to 20 ounces of water and use a misted spray function that gives you medium fineness and not large drops of water. The best of time of day to spray around your home is in the early morning or late afternoon, which is when mosquitoes are out and most prevalent. You will want to spray in areas where mosquitoes are most prevalent, namely in wet and damp areas. Make sure to target brush and plants around your home—another place where mosquitoes tend to congregate during the day. Finally, you should never apply mosquito barrier products when heavy rain is predicted in the next 48 hours. While light rain will generally not affect the effectiveness of mosquito barrier products, heavy and extended rains will further dilute the product and will likely render it useless, thus requiring a second application. Ants aren’t the most destructive house pests. However, they are some of the most persistent; hence, being difficult to destroy entirely. If you’re battling an ant infestation, ant baits are a great way to keep them at bay. You will need to be patient and give them enough time to work, but they will eventually eradicate all the ants in your home. You also need to remember that nearly any ant killer poses a health risk, so you should keep the ant baits in areas where both kids and pets cannot gain access to them. For best results, use any of the products in our review.